Those whose appetite for news extends beyond just trying to keep track of all of Mitt Romney's bizarre utterances will have noticed that the uprising in Syria has escalated into an all-out civil war. The conflict is following the same trajectory as Libya's did last year, with the regime using military weapons against its own population centers. Right now especially fierce fighting is raging in Aleppo, the largest city, and in Damascus, the capital. It's estimated that about 20,000 people have been killed so far. Post-Qaddhâfi Libya, at least, has managed to chart a peaceful (if disquietingly Islamist) course. Syria is unlikely to be so lucky. Libya is, by Middle Eastern standards, a very homogenous country -- almost the whole population is ethnically Arab or Berber, and Sunni Islam is the only religion with any significant presence. 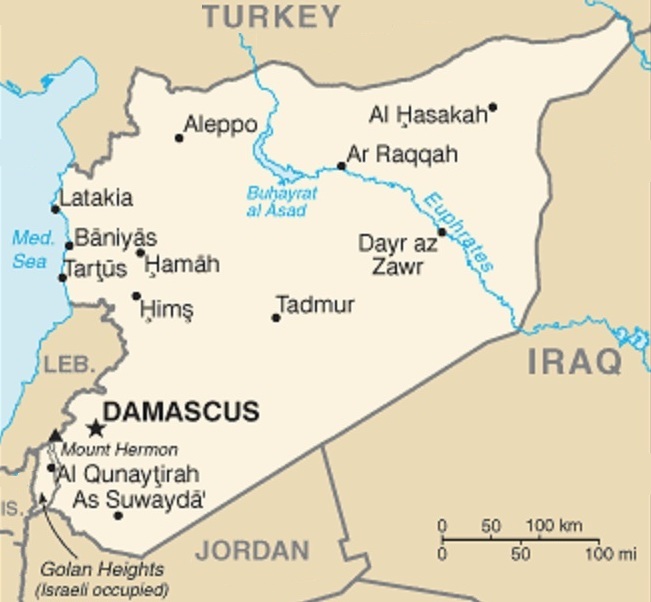 Syria, by contrast, is one of the most heterogeneous countries in the area. Its 22,000,000 people include about 2,000,000 Kurds and smaller ethnic minorities such as the Turkmens (up to 1,500,000) and Assyrians (up to 1,200,000). Most of the rest of the population is ethnically Arab, but religious differences are even more significant. There are about 2,500,000 Christians (the Assyrian minority is mainly Christian) and 500,000 to 700,000 Druze, adherents of a secretive religion derived from Islam and considered heretical by hard-line Islamists. 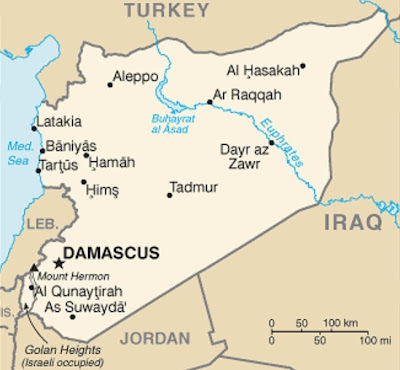 The Alawites, a sect of Shiite Islam numbering about 2,400,000 in Syria, are also widely viewed as heretics by the Sunni majority. The current Asad regime is Alawite-dominated, and the Alawite population generally supports it, out of fear that the Sunni majority identifies them with the regime and would persecute them if it ever overthrew the regime and gained the upper hand. Anyone who knows anything about the Middle East will at once see what a horribly combustible mix this is. Religious differences are the main source of intractable violence in that part of the world. Recall the interminable religious civil war in Syria's neighbor state Lebanon last century, or the terrible violence marking the relatively-simple Sunni-vs.-Shiite split in its other neighbor Iraq (this has created another complication in Syria since there are about 1,300,000 Iraqi refugees in Syria, 20% of them Christian and the rest split between Sunni and Shiite). If the population starts dividing along sectarian lines, there is the risk that the collapse of the regime could be followed by a Lebanese-style civil war; if a Sunni Islamist regime emerged in Damascus, conflict with the large Christian, Alawite, and Druze minorities might lead to the same result if the new regime is weak, or to hordes of refugees fleeing the country if it is strong. The Druze are concentrated in a mountainous area in the south which might prove a defensible stronghold if needed, and the Alawites are concentrated in the province of Latakia, where they are the majority -- but no Syrian regime could let Latakia slip out of its grasp, since it includes the country's main port and the majority of the coastline. There are already signs of rebel forces targeting Alawites and Christians for persecution. The rebels are receiving help from the world's most extremist and barbarous Sunni Islamist regime, Saudi Arabia, and that help likely brings influence along with it. Syria shares borders with the Middle East's two strongest military powers, Israel and Turkey, both of which could feel threatened by chaos there -- Turkey has already taken in a flood of Syrian refugees. A Syrian civil war could also destabilize Iraq, Jordan, and Lebanon. Finally, Syria has an arsenal of chemical weapons, the disposition of which would become a concern if the regime fell. If the worst-case scenario does materialize, it's hard to imagine that the United States will be able to completely avoid getting dragged in, one way or another. We will, at least, have the advantage of a more competent US government than the one that launched the Iraq fiasco (unless Romney has become President by then), but the sheer complexity of Syria will make the challenge of containing its upheaval a daunting one. Reminds me of Yugoslavia a bit. The orthodox Serbs of Bosnia and Croatia were afraid of what would happen if Serbs lost control of those areas. Their history with those two groups wasn't too great. It kills me when news reports call it "ethnic" conflict when religion is really the main difference, as it was in Yugoslavia. We'd be foolish to side with any group no matter how oppressed they are at the moment. We should only side with the concept of peaceful cohabitation. Imagine if we gave everyone in the country $10 for each week without a murder. Wouldn't that be cheaper then sending guns, aid and troops? But...but religion is a force for GOOD! Which, for the ME, is most of the time. LA: Indeed, as in Syria, the Serbs (Orthodox) Croats (Catholic) and Muslims all spoke the same language and had similar cultures -- if it weren't for religion there would have been no real distinction among them. It would take more than $10 to stop people from doing what they think God wants them to do (killing), unfortunately. SK: Yes, a force for good, occasionally, so we should stop criticizing it for all the hate and violence it engenders.